Haiti-USA Visa Question : Should Husband and Wife Apply for a Visa at the Same Time? 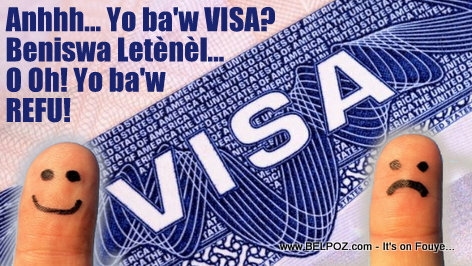 A Haitian couple asked me this US VISA question: "Should my Husband and I apply for a US visa at the same time? We are planing a vacation trip to the US for the first time, BUT some people are telling us if we both apply for a visa at the same time, the consul may think we are trying to leave the country and give us a REFU... Please help..."
I do not personally know the answer to this question AND I would love to hear what a US embassy personnel has to say about it. There are many people in Haiti who believe everything they hear about reasons why you will get a REFU (visa refusal) when you go to the embassy for an interview. What is wrong with a husband and a wife coming going to the Embassy on the same day to request a visa because they wish to visit the United States together on a nice romantic vacation? Why would somebody make them believe they will be denied that visa if they do together to the visa appointment? If you are a U.S. Embassy personnel in Port-au-Prince, perhaps you can post an honest answer for us so I can share it with this lovely couple. QUESTION: When applying for a US Visa, is it recommended for a husband an wife couple to go together and apply if they wish to travel together? The answer is correct, those applying as a couple or family are unlikely to get a visa except if they are very well established in their country--have significant financial investments in their country.